Skip the modified ingredients and preservatives and make your own creamy and delicious homemade caramel pecan ice cream! I do like ice cream, but definitely not as much as everyone else in our household does. Left to their own devices, they’d probably eat it daily. That’s where my feelings of guilt used to creep in. Not because I think eating ice cream all the time is a good idea. You see, last year, I decided I was no longer going to buy foods that contained modified ingredients and preservatives (as much as possible). To my family’s dismay, ice cream disappeared from the grocery list. I may have heard some complaints about there never being anything to good to eat in the house, but I felt better knowing less chemicals were getting into our bodies. This post contains affiliate links, which means at no additional expense I may earn a commission on your purchase. 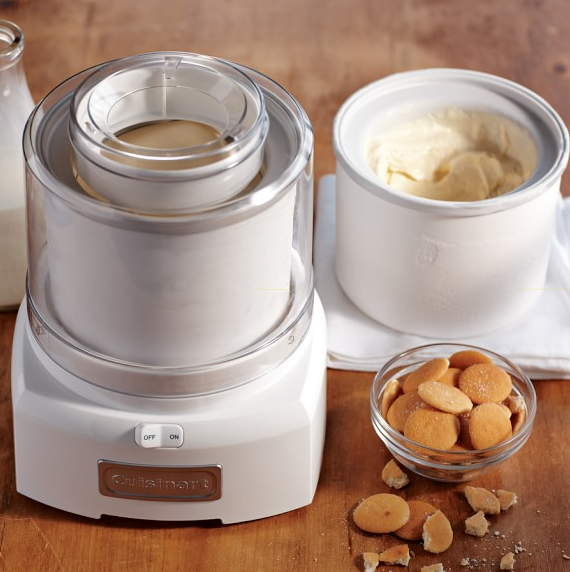 While I was shopping for gifts in December, I came across a steal of a deal on ice cream makers that I couldn’t walk away from. In a way, it was like a gift for the whole family. If I made my own ice cream and controlled the ingredients that went in it, everyone could be happy. I’m back on the nice list (for awhile at least)! I thought I’d start out with something a bit more decadent. You know, seal the deal right away. Who can resist caramel pecan ice cream? I certainly can’t! 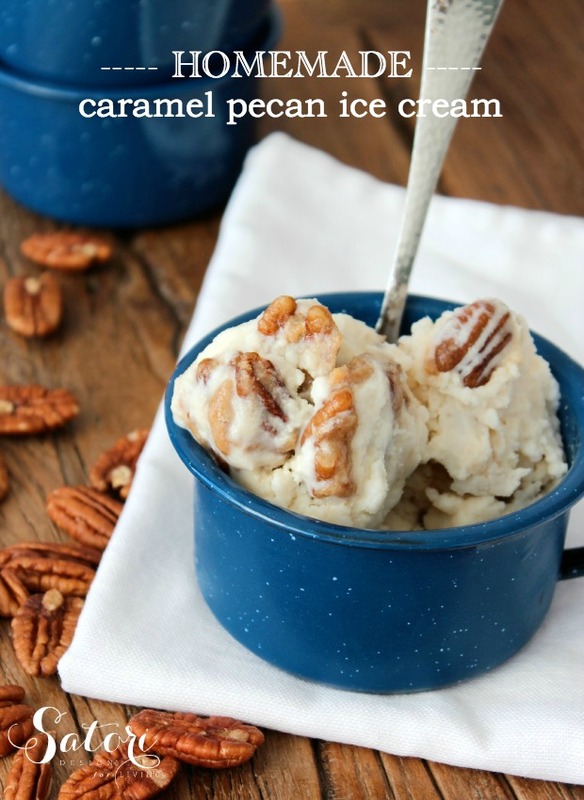 Skip the modified ingredients and preservatives and make your own homemade caramel pecan ice cream! Toast pecans in a pan on medium heat until golden brown. Set aside. Melt the butter in a heavy saucepan on medium high heat. Stir in the brown sugar and reduce heat to medium, stirring frequently until the sugar is dissolved and the butter is incorporated. Add the maple syrup, and mix thoroughly. Bring to a boil for 2-3 minutes (should thicken), then slowly whisk in cream. In a medium bowl, thoroughly whisk milk, granulated sugar and salt until sugar is fully dissolved. Stir in half & half and vanilla. Cover and refrigerate for 1-2 hours. Following the directions of your ice cream maker, churn mixture until thickened, approximately 15-20 minutes. About 5 minutes before ice cream is thickened, break apart pecans and add to ice cream while still churning. If you like your ice cream soft, serve immediately. For firmer ice cream, transfer to an airtight container and place in freezer for at least 1-2 hours. A tiny bit of this ice cream goes a long way! So far, we’ve made fresh strawberry ice cream and this caramel pecan one with our Cuisinart ice cream maker. Not sure which one’s my fave. You can check out the one I picked up here with the extra freezer bowl. So far, so good! Or, this one on Amazon is a better deal if you just need one bowl. 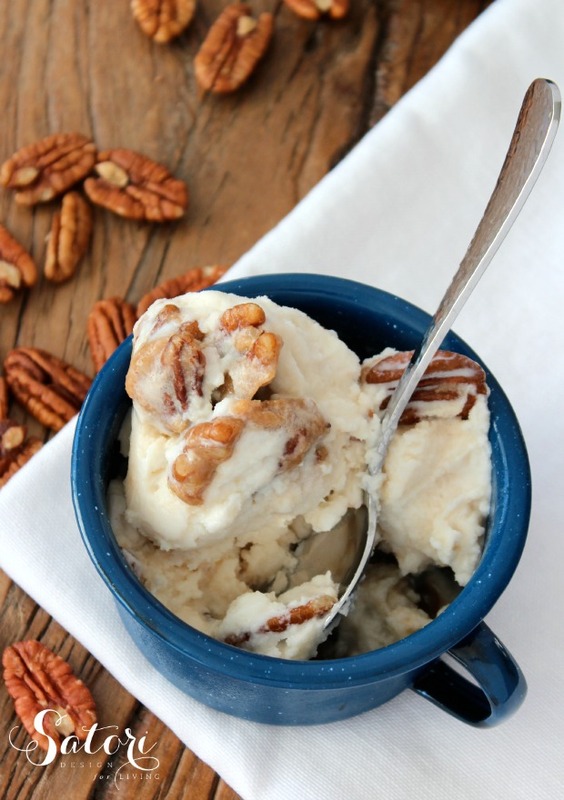 Pin this caramel pecan ice cream recipe for later! Do you make your own ice cream? Have a favourite recipe? I’d love to hear about it! I don’t make ice cream as often as I would like to. You can’t compare the taste to any ice cream you buy at the store. My fav recipe is vanilla. Yours look delicious! I love that you talk about cutting calories in your ice cream post :-). I’ve actually been meaning to try making ice cream at home, and this might be the kick in the pants that I needed! This looks amazing and I’m psyched that there are no eggs in the recipe. Thanks for sharing! I was like you and had been putting it off for a long time. No regrets investing in a machine here! YES! An egg-free ice cream recipe!! I LOVE pecans, so I’ll definitely be trying to recipe soon. We have home made ice cream every birthday and most holidays. My husband uses a very old hand crank machine that was on our farm for at least 60 years. No name on it. Our ice cream uses whipping cream and eggs and we flavor some of the with instant jello powders like butterscotch very good. OMG, my mouth is watering just looking at the photos. My mom gave me an ice cream maker just like this. Your recipe with caramel and pecans looks fabulous! I need to make some! I love homemade ice cream and this looks delicious. I will have to give it a try. How much ice cream does this recipe make? Hi Helen, It makes just under 1.5 quarts.